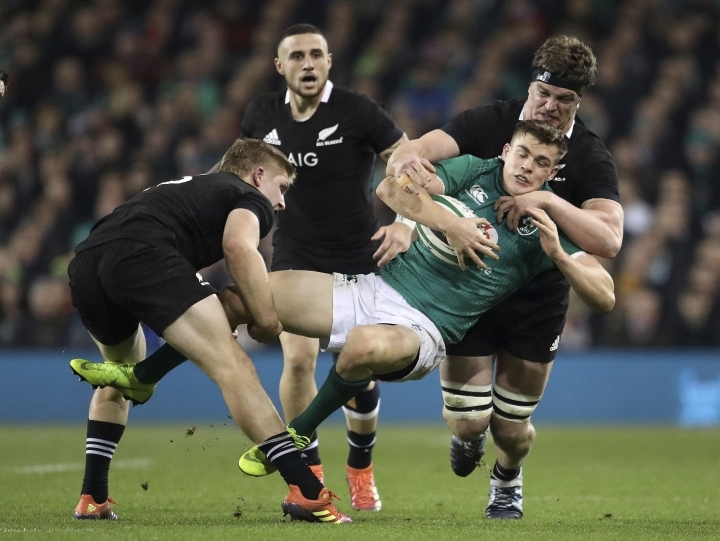 DUBLIN — Only center Garry Ringrose has kept his run-on jersey in the Ireland side meeting the United States in a rugby international on Saturday at Lansdowne Road. Flanker Rhys Ruddock captains the second-string side which more closely resembles the one which thrashed Italy's backup players 54-7 in Chicago at the start of the month. "I wanted Stu to get in between a couple of ballplayers, but challenge him to be a ballplayer as well,' coach Joe Schmidt said. "We know he's a ball-carrier, we know how strong he is. (U.S. opposite) Paul Lasike is one of the few men in world rugby who is actually bigger than him in his face-to-face positional challenge. "So going up against an ex-Chicago Bear and a very talented player, it's a big challenge." "If you're not absolutely on the money then there's a big risk for us," Schmidt said. "So it certainly helps focus the mind, focus the training and allows you to leave behind last week, as special as it was for us." United States: Will Hooley, Blaine Scully (captain), Bryce Campbell, Paul Lasike, Marcel Brache, Will Magie, Shaun Davies; Cam Dolan, Hanco Germishuys, John Quill, Nick Civetta, Greg Peterson, Paul Mullen, Joe Taufete'e, Titi Lamositele. Reserves: Dylan Fawsitt, Chance Wenglewski, Dino Waldren, Samu Manoa, David Tameilau, Ruben de Haas, Gannon Moore, Ryan Matyas.